“meat preserved by smoking, curing or salting, or addition of chemical preservatives.” Ham, bacon, pastrami, sausages, hot dogs and cold cuts are all considered processed meat. It’s not yet clear exactly why these meats increase risk for colorectal cancer. It may be the added nitrites and nitrates, the smoking and/or high temperatures used in some processing, or the heme iron in red meat. Does this include nitrate and nitrite free meats and sausage? 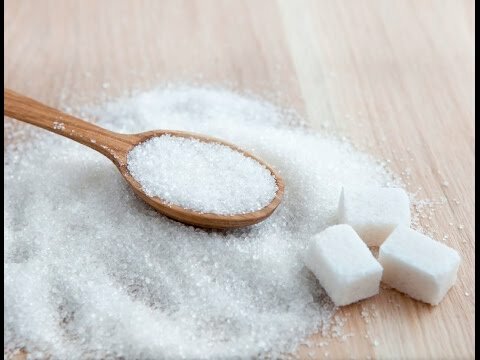 These products are relatively new, so we need more studies that make these distinctions. Replace sausage in chili and soups with beans like kidney beans, chickpeas and lentils. 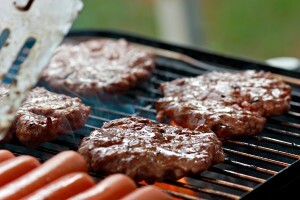 IARC has also listed red meat as a probable carcinogen. 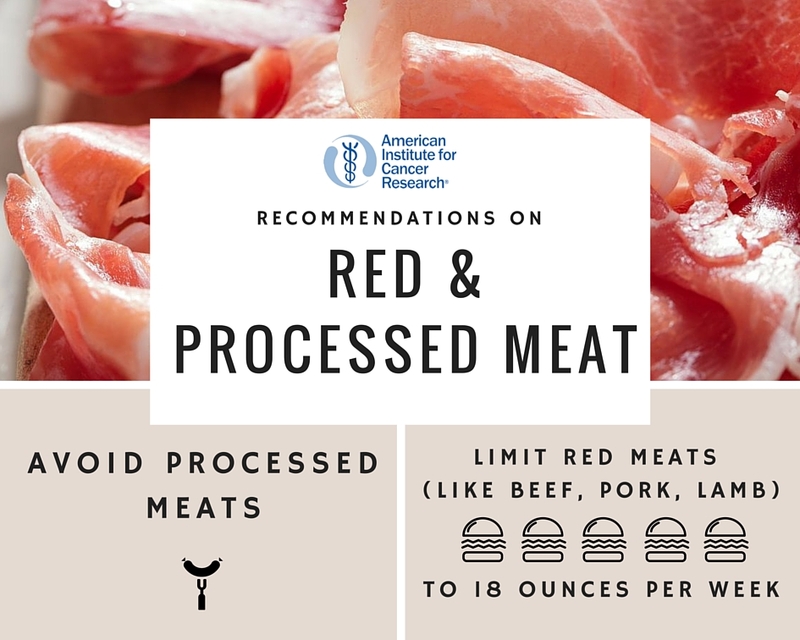 AICR’s recommendation for red meat is to keep your red meat to less than 18 ounces (cooked) per week. That’s about 4 hamburgers (quarter-pounders) weekly. For more on how to lower risk for colorectal cancer see the latest from the AICR/WCRF expert report continuous update here. Visit AICR Healthy Recipes for delicious recipes for chicken, fish, beef and pork. I would definitely like to see more research done on meats processed without chemicals. Intuition tells me these are probably safer. Also, my family eats mostly wild venison, how does this type of meat compare with farm raised beef/pork. Another layer would be to look into organic grass-fed meats versus large factory farm meats. The fact is humans have been eating meat a long time. Have we always had these cancers? Is it because we’re living longer? Or is it because we are injecting our animals with god knows what and feeding them primarily corn. Would turkey sausage that is made from “fresh ground turkey with seasonings” (Shady Brook Farms Sweet Italian Turkey and Shady Brook Farms Breakfast Sausage come to mind) be classified in the same group of processed meat that the study was looking at? Are there any deli meats like turkey that are considered better choices? Safer? Specfic brands? Is breaded Chicken strips processed meat too? Technically, chicken nuggets would be considered processed, but keep in mind that the vast majority of the research on processed meats and cancer risk would be on sausage, bacon, hot dogs and lunchmeat. I would definitely like to see more research done on meats processed without chemicals. Intuition tells me these are probably safer. Also, my family eats mostly wild venison, how does this type of meat compare with farm raised beef/pork. Another layer would be to look into organic grass-fed meats versus large factory farm meats. The fact is humans have been eating meat a long time. Have we always had these cancers? Is it because we’re living longer? Or is it because we are injecting our animals with god knows what and feeding them primarily corn. I think we need to be careful of throwing the baby out with the bath water and carefully analyze our modern farm and food preservation practices. That said, if you are eating more than 18 oz of meat per week you need to cut back anyway and you are probably not eating enough grains and vegetables. does this include pepperoni?!? what about turkey pepperoni??! turkey sausage or turkey bacon? Hi Candess – yes these are all considered processed meats.